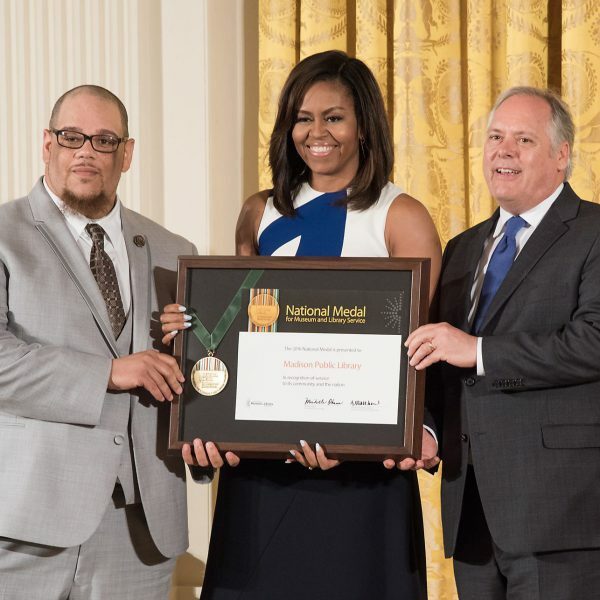 Rob Dz and Director Greg Mickells receive the IMLS National Medal for Museum and Library Service from First Lady Michelle Obama. 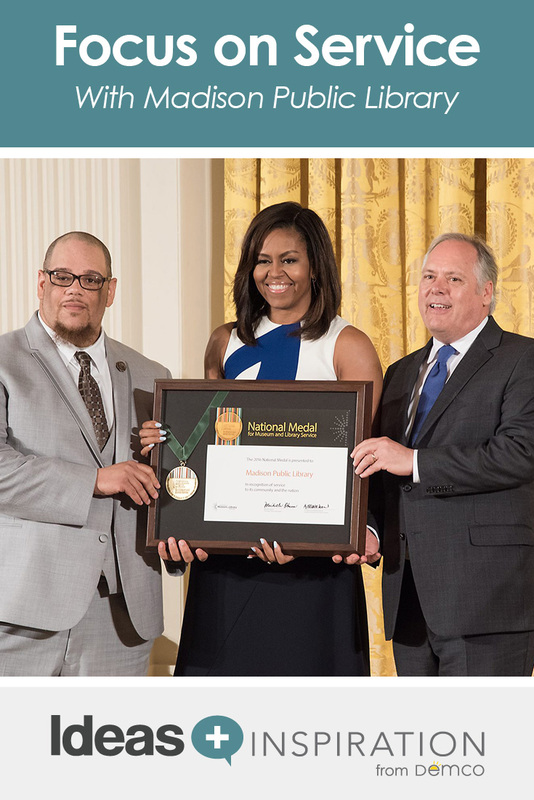 It’s stories like these and the commitment MPL has shown to serving its community that recently earned the library system the IMLS National Medal for Museum and Library Service. 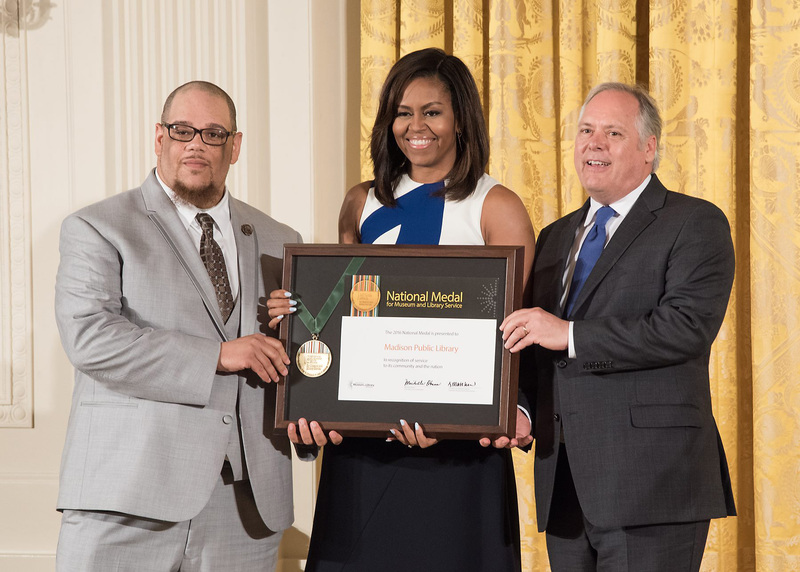 On June 1, 2016 Rob joined Library Director Greg Mickells in accepting the award from First Lady Michelle Obama. 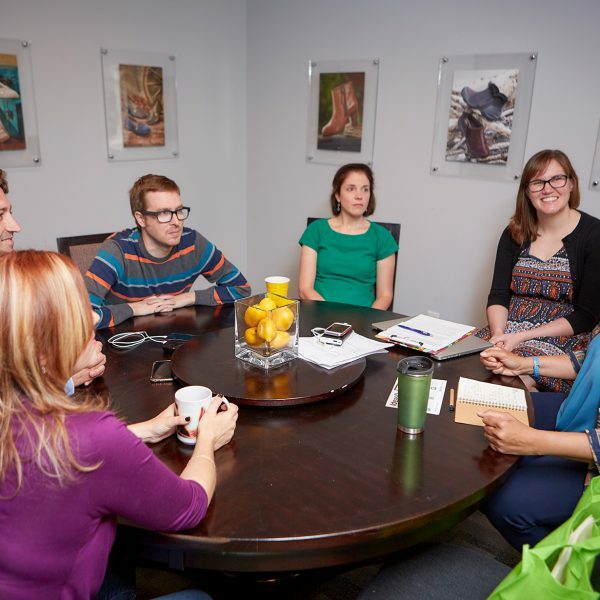 Talk to any of the staff members who work at MPL and you’ll quickly see that they aren’t about to slow down. I recently had the opportunity to sit down with five inspirational MPL employees to learn about what they have planned for the future. From community outreach programs and partnerships to diverse programming and creation spaces, the staff are already looking to the next thing they can do to serve their community. 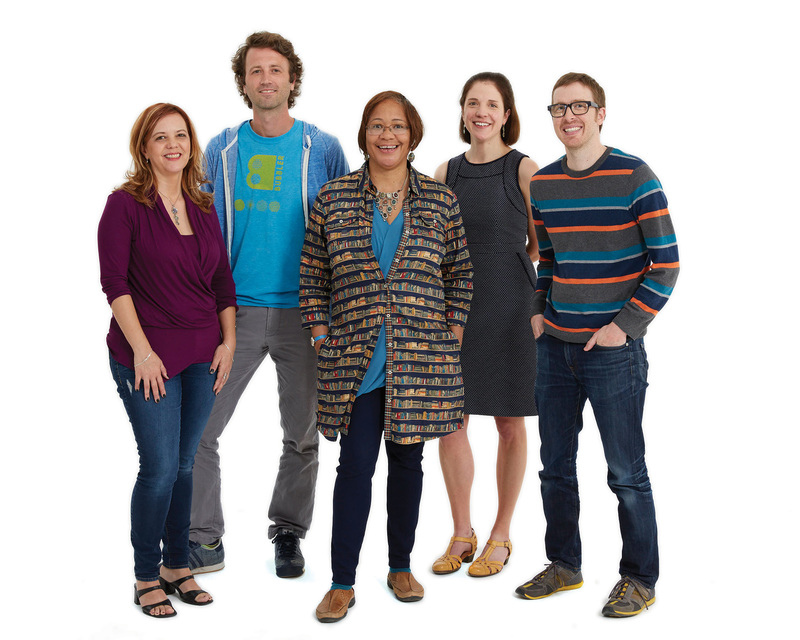 From left: Youth Librarian Tammy Pineda, Teen Services Librarian Jesse Vieau, Library Supervisor Janetta Pegues, Community Engagement Librarian Mary Fahndrich and Head Bubblerarian Trent Miller. Janetta Pegues: I am the Supervisor for the Goodman South Madison Branch, and I do some of everything: make sure the library runs properly and smoothly, work the desk and create programming. Tammy Pineda: I’m the Children’s Librarian at the Central Library. I am busy in the community, all over town. It’s all outreach and partnership for me; that’s what I really love to think about and talk about. Jesse Vieau (Teen Services Librarian): When it comes to serving teenagers, or anybody, my goal is providing access to resources. A lot of it is just finding people who know things or have things and want to share those things with other people. Trent Miller (Head Bubblerarian): I oversee The Bubbler program. It’s a system-wide, maker-focused program that is more art-based than a lot of programs around the country. At the Central Library we have a room called the Bubbler Room where we do workshops and classes. We also have an artist-in-residence program right there, which is one of my favorite things. Our Media Lab covers the tech side of programming, where we work with Jesse to bring in a lot of teen groups. Mary Fahndrich: I work at the Central Library as well. I’m transitioning into a new position as a Community Engagement Librarian. While I do traditional work at the reference desk, I also focus on services to the aging population and the five social services agencies we have partnered with that run out of the library. We have permanent on-site services for the homeless population. It’s so necessary to provide services right away, to be able to point them to someone right in the library that can help with housing, food, addiction issues, mental health issues and more. 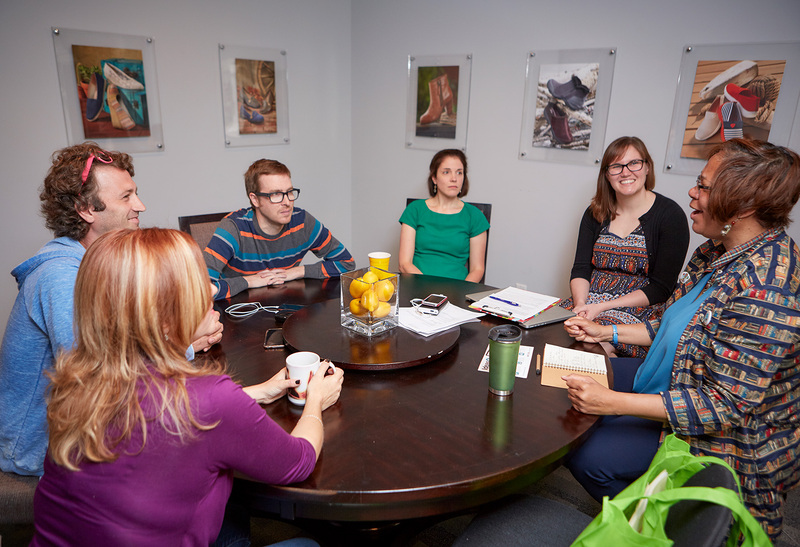 What are the most important things MPL staff are doing to support this high level of service? Deep in discussion from bottom left: Tammy Pineda, Jesse Vieau, Trent Miller, Mary Fahndrich, Demco Copywriter Michelle Blaser and Janetta Pegues. Jesse: My favorite word in the IMLS write-up was “intentional.” I really like that we’re way more intentional now than we were even three years ago. I hope that without forcing things we’re still intentional in strategic partnerships and making sure that the populations that most need it are aware and are receiving it. Mary: It’s all about connecting with the folks who are already doing the work, rather than just trying to start from scratch. Go to the agencies supporting the groups that are already doing this. Janetta: Right. There’s no point in reinventing the wheel. We can just work with them and send our patrons there. And they don’t do books and materials, so they send their customers to us. Jesse: I think it all goes back to connecting people to resources. It’s all about just casting the wide web, and as soon as you put that flag up, you don’t have to force anything; it just falls into place. What’s next for MPL? How will you continue your success in the future? Trent: We have a large IMLS grant right now that will help us bring our Bubbler programs out into the other branch libraries and out into the community. We’ve created these kits through Maker Corps and hired two people this summer who have extraordinary educational backgrounds to run these kits. We have Makey Makey® kits, screen printing, sock monkeys and more that they’ll be able to take out and share with youth in the community. With The Bubbler program as a newer service, we’re almost an expert in the field. We’d love to have some prepared materials to send out to other libraries wanting to do this kind of programming. Pushing out nationally or internationally would be a great way to connect with other public and school libraries. Mary: I’m working with the Madison Senior Center for more programming for the aging population. We’re working on getting the library to be a dementia-friendly site. There will be a sticker on the door to let caregivers and family members know that the staff is trained to help them. Tammy: I want us to keep finding ways to tell our story. We shouldn’t have to win a national award to have a lot of people understand what we do. It would be great to find a tool to help more fully understand where the gaps are with our current partnerships, as well as identify places we aren’t reaching and what we can do better. I look forward to expanding programming out to a more diverse audience. Janetta: On that same note, everything needs to be more reflective of the community we actually serve, and we need to be more intentional with that. It’s really a collaborative partnership between not only the staff and members of the community, but also our patrons. Love the people. That’s what it really boils down to. To love people and be dedicated to service at the highest levels possible. A lifelong reader and learner, Michelle entered the working world many years ago as a library page. Today she channels her love of libraries into her work as a copywriter at Demco.